Government will fail to solve the housing crisis unless radical changes are made to the planning process. The National Audit Office has released a new report — Planning for new homes — which asserts government’s planning system is unable to demonstrate it’s meeting housing demand effectively. LABM garners opinion from across the sector. The Ministry of Housing, Communities & Local Government (Department) aims to support the delivery of 300,000 new homes per year from the mid-2020s. To increase supply, it has implemented reforms to the planning system to help local authorities in England determine how many, where and what type of new homes should be built. Between 2005-06 and 2017-18, 177,000 new homes per year have been built on average and the number has never exceeded 224,000. To meet its ambition, the Department will need to oversee a 69% increase in the average number of new homes built since 2005-06. The number of new homes has increased every year since 2012-13, with 222,000 new homes built in 2017-18. 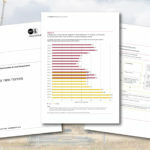 In 2017, a standard method was developed for local authorities to assess the number of new homes needed in their area. The method has weaknesses and the MHCLG intends to revise it to be consistent with ensuring that 300,000 homes are delivered each year by the mid-2020s. 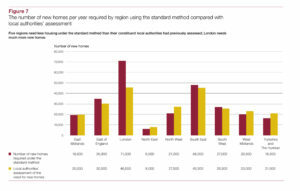 Compared with the need assessed previously by local authorities, the standard method reduces the need for new homes in five out of nine regions, which could hamper local authorities’ plans to regenerate. The standard method sharply increases the need in London — 31,723 homes were built in 2017-18 but this will need to more than double to meet what the Department thinks is necessary. As of December 2018, only 44% of local authorities had an up-to-date local plan setting out their strategies for meeting the need for new homes, despite it being a legislative requirement. If a local authority cannot show it has a five-year supply of land for housing, developers have greater freedoms to build where they want, risking ill-suited developments. As of November 2018, the Department had only challenged 15 local authorities that do not have an up-to-date plan. To create new homes and places for people to live, infrastructure such as transport, healthcare, schools and utilities must be in place, but this is difficult as government departments are not required to tie their investment strategies with local authorities’ infrastructure plans, creating uncertainty about how some infrastructure will be funded. The Department has only done a rough estimate of the infrastructure funding required for new homes, so future costs are uncertain. The systems to get developers to contribute to infrastructure costs are not working effectively, with developers successfully renegotiating initially agreed contributions on the basis they will be unable to maintain profit margins. Contributions agreed with developers slightly decreased between 2011-12 and 2016-17, despite house prices in England increasing by 31% and profit margins of top developers increasing. If developers do not contribute, the result is either less infrastructure is built, or local authorities or central government must pay more. The Department is introducing reforms in this area, but some will not take effect for several years. The Department reports that local authorities are increasingly processing planning applications within target timescales, but this might reflect a greater use of time extensions rather than increased efficiency. The Planning Inspectorate is slow to determine appeals from developers whose applications have been refused and acknowledges its performance is unacceptable. The time it took to determine an appeal increased from 30 weeks to 38 weeks between 2013-14 and 2017-18. Total spending by local authorities on planning functions, such as processing planning applications, fell 15% in real terms between 2010-11 and 2017-18. The Department has attempted to deal with a shortage of planning staff in local authorities, for example by funding a bursary scheme, but it does not know the extent of the skills gap as it lacks comprehensive data. The Planning Inspectorate has struggled to recruit, experiencing a 13% fall in staff between 2010 and 2018. The Department’s National Planning Policy Framework, published in July 2018, is an important step in planning policy but it is too early to tell whether the changes it introduces will be effective. Alongside this framework, the Department needs to regularly monitor the gap between its ambition for 300,000 new homes and what is being planned. It needs to work with local authorities and other government departments to ensure that infrastructure is delivered more effectively, and work with industry bodies to conduct research into the skills gaps in local authorities’ planning teams. The Royal Town Planning Institute is renewing its call for more resources for planning in light of the NAO report. The RTPI welcomes the findings of the Planning for new homes report. It flags up many critical issues the Government needs to address to maximise the ability of the planning system and planners to help deliver its housing targets. This includes highlighting the fall in spending by local authorities on planning functions and the current skills shortages in local authority planning teams. Sue Manns FRTPI, RTPI Vice-President, said: “The RTPI has long campaigned for the Government to adequately resource local authority planning teams to deliver local plans and help deliver its targets for quality homes and infrastructure. Our own report published last week — Serving the public interest? The reorganisation of planning services in an era of reluctant outsourcing — found that under-resourcing, coupled with reforms that have lessened planning’s strategic role, have relegated planning to a largely reactive, regulatory function in many local authorities, undermining planners’ ability to deploy professional discretion and proactive planning. “This is further underlined by today’s report by the NAO that core funding for planning functions in local authorities has fallen by a whopping 37.9% in the past seven years. The fact that spending has only dropped by 15% is a testament to the planners themselves who have raised significantly more direct income to help plug the gap. There is a huge resourcing issue. Victoria Hills MRTPI, RTPI Chief Executive, added: “We welcome the NAO’s findings that to create new homes and places for people to live, infrastructure such as transport, healthcare, schools and utilities must be in place. This will require government departments to align their investment strategies with local authorities’ infrastructure plans. Responding to the report, Cllr Martin Tett, Local Government Association’s Housing spokesman, said: “Planning is not a barrier to housebuilding. Council planning departments are doing an incredible job with extremely limited resources, approving nine out of 10 applications, with the majority processed quickly. “Councils are committed to ensuring homes are built where they are needed, are affordable, of high-quality and supported by adequate infrastructure and services, but it is vital that they have an oversight of local developments. “We remain clear that the Government’s housing needs formula does not take into account the complexity and unique needs of local housing markets, which vary significantly from place to place, and imposes unfair and undeliverable targets on communities. This risks leading to a housebuilding free-for-all, which will bypass the needs of local communities and could damage public trust in the planning system. The National Audit Office (NAO) has confirmed that the Government will fail to solve the housing crisis unless radical changes to the planning process are made. The NAO says that the planning system is underperforming because councils use outdated information to calculate how many new homes they need to build. At best, continuing the use this outdated data will only deliver 250,000 homes a year. The National Federation of Builders believes the NAO is right to point out that government cannot hope to build 300,000 new homes every year without reforming the planning process. However, when considering the reasons why we are not building enough homes, the NFB feels the NAO does not tell the whole story. Helping developers access finance after they secure planning permission. Matt Thomson, Head of Planning at the Campaign to Protect Rural England, commented: “To deliver the right types and number of homes that communities need, in the places where they are needed, it is essential that our planning system delivers. But for too long, our countryside, local councils and their communities have been let down by a failing system that prioritises delivering abstract housing targets over building homes that the people who need them can afford to live in. Long-term empty homes in England up 5% in the last year, according to latest MHCLG figures.